They examine the intent and emotional impact of potentially harassing behaviors. 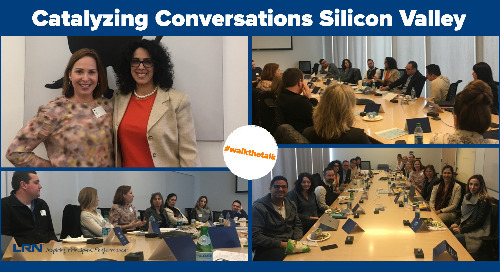 LRN’s Marsha Ershaghi Hames was invited as a guest compliance expert author for HRmorning.com, a news source for 239,000 human resources managers and executives. 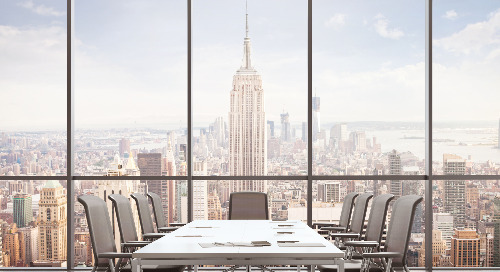 In her article, she explains that business leaders have the power – and responsibility – to prevent sexual harassment, misconduct and abuse in the workplace, especially through their anti-sexual harassment training. For such training to have an impact, she explains, the dialogue needs to start around the role and accountability of leaders in modeling the organization’s policies and decision-making. This builds credibility, transfers responsibility to those who are shepherds of the corporate culture on the ground and promotes ongoing opportunity for healthy dialogue. 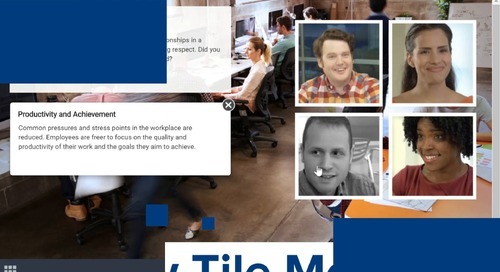 A key first step toward building a more equitable work culture is training leaders early on about the universal standards that everyone in the organization are held to, from the workforce, through middle, senior and top management. Unfortunately, as the headlines prove, most training programs have focused heavily on laundry lists of specific rules and forbidden behaviors. There has been too little attention given to the underlying causes and enablers of harassment. 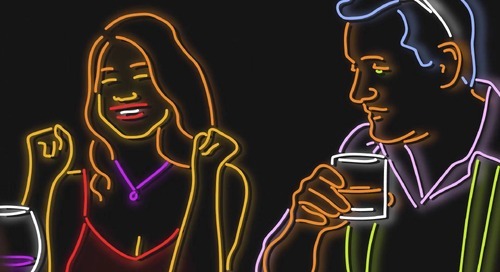 The most effective anti-harassment training programs look deeper: They raise awareness of right versus wrong behavior by exploring the nuances behind practices and behaviors that lead to sexual misconduct. At LRN, we have two potent examples of training programs that help to create a single standard of behavior in the workplace when it comes to harassment. One develops managers to adopt a zero-tolerance stance on sexual harassment and coaches them on how to navigate the power inherent in their positions responsibly. Another promotes greater skills around listening up, encouraging both employees and supervisors how to be allies to, and supporters of, victims of harassment. For example, LRN has a series of conversation starters on difficult situations such as how bystanders and observers of harassment and discrimination can be better informed and empowered to take action. Take a look at LRN’s guidance on how to be an “ALLY” to victims of harassment. Organizations that demonstrate more transparency around their procedural justice practices can build greater trust in the system and promote more speaking out. 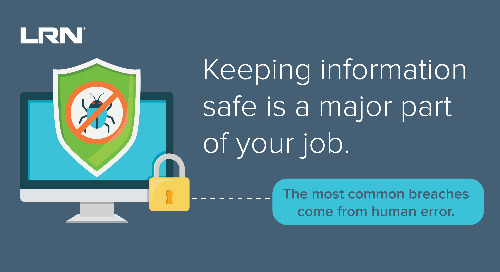 Taking action, rather than paying lip service to the “company’s commitment,” really matters. New York Companies Will Have to Provide Anti-Sexual Harassment Training: What Kind of Training Will Really Work? 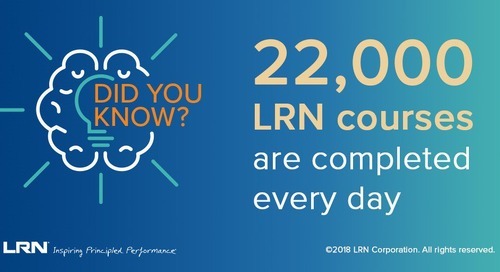 Schedule A Demo Or Consultation With An LRN Expert Today! 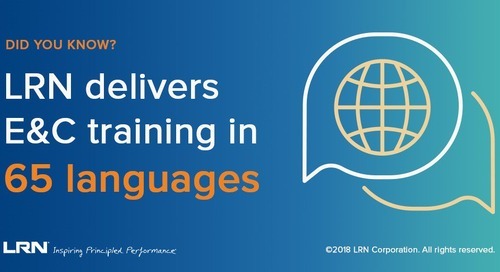 Get the results of LRN's 2018 Learner Survey, including responses from more than 398,000 learners. Learn more about our top topic areas in 2018 and our values-based educational content that goes beyond rules-based compliance. 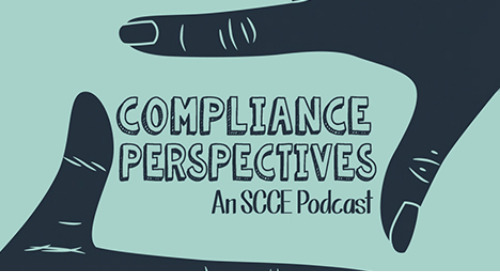 To avoid workplace scandal, companies must move away from “check the box” training and toward corporate learning that encourages ethical behavior. Here are a few ways companies can do just that. 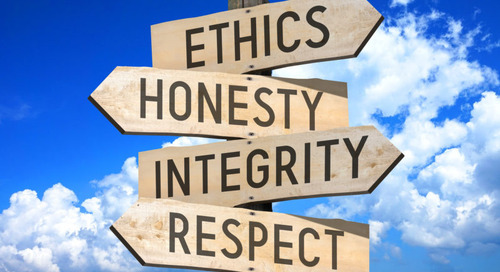 Read this factsheet to learn about LRN's comprehensive ethics and compliance (E&C) solutions to help organizations' build thriving, values-based cultures and drive business outcomes. Click here to take a sneak peek of LRN's latest, top-rated E&C course offerings spanning a plethora of industry-relevant topics. 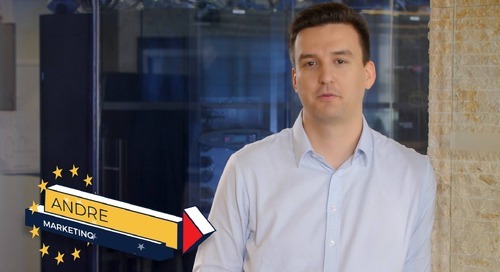 Click to watch this teaser of our Telly-awarding winning video, "What Happens In Vegas," which is featured in our Trust & Respect in the Workplace course. Click here to view LRN's course clip on the General Data Protection Regulation (GDPR). 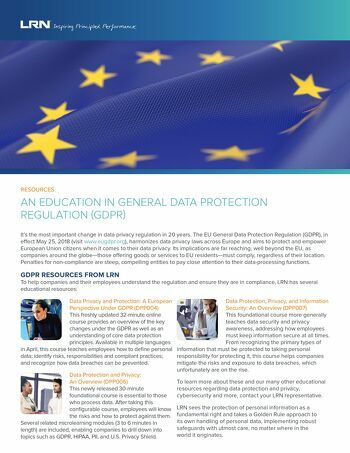 Download & share this fact sheet with employees to give them an overview of GDPR. 2017's end-of-year course survey included responses from 180,000 learners, who agree that LRN's courses are high quality, engaging, and help to make connections between risk scenarios and real-life. This video is excerpted from one of our courses that helps supervisors learn about the legal and practical aspects of workplace discrimination. Click here to watch. 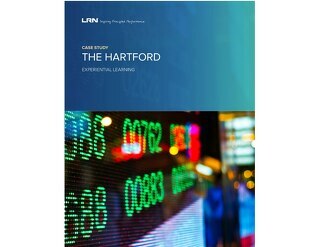 Read our case study to learn how we worked together with The Hartford to accomplish their ethics and compliance training goals. Click to watch this video on Gender Identity and Expression, where a manager talks to his team about a new transgender employee. 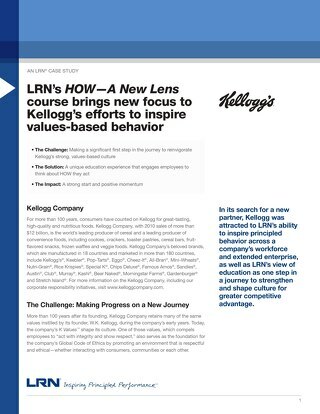 Kellogg turned to LRN when they determined that they wanted to do more to assure their ethics and compliance training did not become a “check-the-box” exercise. 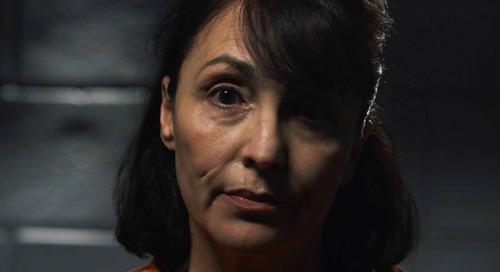 This short video illustrates the challenge employees may face when presented with the opportunity to engage in bribery. Click here to watch now.